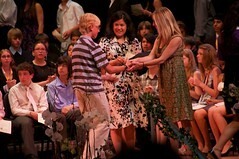 Luc graduated from middle school today. We are so proud of him. He is growing into an active, confident, intelligent young man. I often forget how much he has gone through on Jordan’s Journey. He has his own brand of strength, and too often it gets lost in the shadows of his sister’s larger-than-life personality. He is as much an inspiration as she is. I am proud of her today, too. First, she managed to keep a secret. We bought Luc a 50mm lens for his camera as a gift for graduating. Ordinarily, we don’t reveal our gift selection to Jordan because she has loose lips. When she asked me this time what we were gifting, I took a chance, but I also warned her that I was trusting her not to reveal the surprise. She did it! You would think that we might have one day to celebrate without worrying about life with a brain tumor, but sadly, Jordan had a seizure during Luc’s commencement. Her seizures are coming on at a rate of nearly one per day now. Like most of them, this was mild. I turned during the ceremony to see Jordan coughing, as though she might vomit. Jeanette turned to me and whispered, “she’s having a seizure.” For the next several minutes, while the principal read off the names of each graduate, I heard Jeanette quietly ask Jordan her name. Jordan stared forward, blankly, mumbling inaudible sounds, gradually forming them into words. As she returned to us, she frowned and looked uncomfortable. I asked if she wanted to go home. – As soon as Lucas graduates, I’m out of here. I nodded. She sat still. When people cheered and screamed for their graduates, Jordan winced and told us the sound hurt her head, but she would not leave until she saw her brother walk across the stage, shake hands with the administrators, and collect his certificate of promotion. Immediately after, she exited the building and I walked her home. It is very hard for me to watch–this constant, dull progression of symptoms. She told me, “I guess my body is just having a hard time. It’s not doing as well with the cancer.” I told her to cut herself a break and take things one day at a time. She agreed with me, but she was somewhat dispirited. I changed the subject and told her I couldn’t believe how big my kids were getting. She chuckled, and asked if I could handle the fact that she would soon be 12. I told her it was hard on my blood pressure, especially because she is clearly growing up to become such a beautiful young lady. She liked that comment, and told me everything would be okay. Every time she tells me that, I absolutely believe her. If anyone can will their way to health and prosperity, certainly it is she.